Creating dynamic, functional emails formerly required a graphic designer, or spending hours at the computer editing code yourself. Simple actions such as dropping images where you like, or easily moving elements from one part of the template to another called for multiple steps; adding video in an email-app-friendly form could often be worse with unpredictable results. Things could get very frustrating, very quickly. And so this became our challenge: How could we address your concerns and reduce your frustration, while incorporating the very best of what FeedBlitz has to offer? And that’s what we’re announcing today: Building compelling, practical, multi-dimensional email marketing campaigns just got a whole lot easier, and a whole lot better, with our new drag and drop email editor, the VME! How is the VME different from other email editors? Begin with a structured template, build your own from scratch, or start from a previous mailing. Drag and drop mailing elements, from text to video to buttons to social and more! Instantly preview your mailing in desktop or mobile versions while you’re working. Easily mix and tailor automated content (such as your blog’s RSS feed, or the latest from Instagram, Pinterest, or Shopify) with your own carefully crafted copy. Access hundreds of thousands of beautiful, royalty-free, commercial use images, or simply drag and drop custom artwork from your computer. 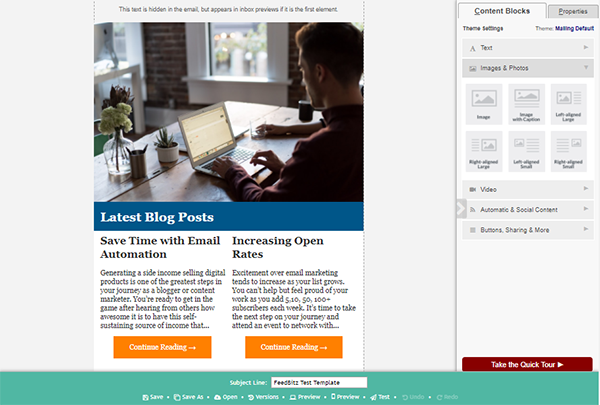 Easily edit the entire email’s look and feel in a few clicks, change it instantly by applying a theme, or highlight specific content areas and change them for the occasional graphic pop! Access any previously saved version at any time for those “uh-oh” moments. Full undo, redo and autosave. Create your own template library. The VME is the first of two large product initiatives we’re rolling out this year. It is, in effect, an early release of the brand new user interface being developed from the ground up. We’re making FeedBlitz much more intuitive to use, more flexible, and more modern, so you can not only achieve your email marketing goals more quickly, but also more capably. There’s so much more to come! To work with the VME, select your mailing list, then I want to – Send, Schedule a mailing. Choose Newsflash, and the VME option will be available on the following page. Once you get going, you’ll find a quick tour pointing out the main features in the right side bar — and then it’s open to you to create the mailing you desire. If you have any questions along the way with the VME or any of our FeedBlitz features, send our Support Team an email. You can also chat, check out our Help Forum, or give us a call at 1.877.692.5489. Our Support and Sales Desk is available Monday – Friday from 9 am to 5 pm EST.